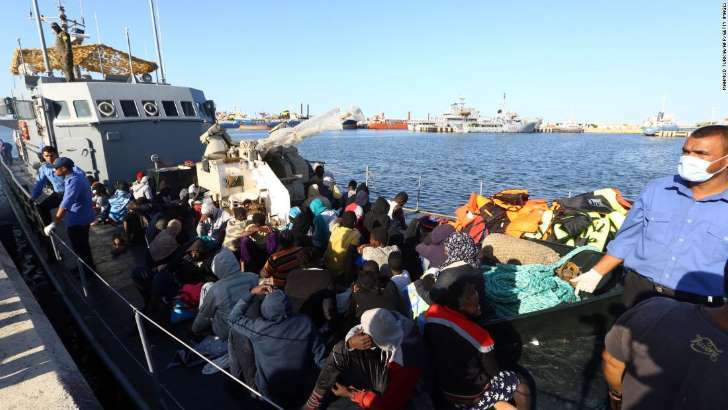 By Nima Elbagir, Raja Razek, Alex Platt and Bryony Jones, CNN | MAHMUD TURKIA/AFP/Getty Images Migrants rescued from the Mediterranean arrive at a naval base in Tripoli in October. Tripoli, Libya (CNN) — “Eight hundred,” says the auctioneer. “900 … 1,000 … 1,100 …” Sold. For 1,200 Libyan dinars — the equivalent of $800. © Raja Razek/CNN The Triq Al-Sika Detention Center in Tripoli, where some migrants are held by Libyan authorities before they are repatriated. One of the detained migrants, a young man named Victory, says he was sold at a slave auction. Tired of the rampant corruption in Nigeria’s Edo state, the 21-year-old fled home and spent a year and four months — and his life savings — trying to reach Europe. When his funds ran out, Victory was sold as a day laborer by his smugglers, who told him that the profit made from the transactions would serve to reduce his debt. But after weeks of being forced to work, Victory was told the money he’d been bought for wasn’t enough. He was returned to his smugglers, only to be re-sold several more times. “I could not make it, but I thank God for the life of those that make it,” he says. CNN’s Lauren Said-Moorhouse, Byron Manley, Henrik Pettersson, Mark Oliver and Muhammad Darwish contributed to this report.